The Connected Educator's Hotspot: How do you flip the "Switch?" We are nearing the end of another school year, and I am facing the end of year in my new school. It has been an incredible journey taking over a larger building and taking on the leadership of a Middle School philosophy as well. I have truly enjoyed these challenges and have greatly embraced what I thought would be a daunting task of dealing with Middle Schoolers. I also happen to be tackling the change process with my Building Leadership Team, as we dive into alignment with the Common Core, spelling out specifics of our RTI program, and developing our vision for what we want for our students and our school. As fate has it, I also started listening to my new audiobook, "Switch; How to change things, when change is hard," by Chip and Dan Heath. This was recommended by a friend on Twitter and I thought it may be very interesting at least, as I had also listened to their book, "Make it Stick." "Switch" has given me some great reminders regarding leadership and even a few new insights that I hadn't considered with regards to creating change within schools. I am coming to the end of my first year in a new building. I was hired for my experience in creating a Professional Learning Community that was very successful and my ability to lead change. I think my staff and possibly even my supervisor was becoming concerned because our progress with change was pretty slow this year. There are a few reasons for that, not all of which are good excuses. Foremost though, is my belief that unless we are a school with "grave" concerns, I prefer to take my first year to observe the culture and practices of my building to determine, what may be the proper course of action. Are there curricular issues, are there cultural issues, are there staffing issues, etc., etc. I haven't seen any "grave concerns" so I only tried to make changes that everyone else was ready to make as well, except possibly for my exuberance for integrating technology. That quick initiative came back to haunt me a little. So, I have spent the focus of my time observing, learning and preparing my Building Leadership Team to become my PLC Leadership Team. To make this transition the team had to become knowledgeable about PLC's, Leadership, and being a Team. First we studied up on PLC's by taking a couple of members to Adlai Stevenson High School in Lincolnshire, IL. They offer a full day workshop/seminar on their philosophy and practices as a PLC. It was an excellent experience that I blogged about here. We have also just finished a book study with a book by Patrick Lencioni. Many of my PLC tweeps have heard me talk of "The Five Dysfunctions of a Team," book before, and I have to admit, I think it is a classic. It tells the tale of an imaginary company and a CEO that inherits a dysfunctional team. She leads them though an incredible growth experience and guides them to become a highly effective team. I see this as my job where ever I go to act as principal. I have utilized the pyramid of dysfunctions almost as much as I have stressed the pyramid of interventions philosophy in our RTI system. They are excellent reminders as to why we need to be an effective team if we want our students to achieve great success and if we want to be recognized as an elite school with students that love becoming lifelong learners. My goal is to be the school that other schools want to come visit and see what they can learn from us. But as I have encountered in the past, sometimes these change initiatives need more than just knowledge of these dysfunctions. While I believe we can create a trusting environment, and hopefully even overcome the fear of conflict, sometimes the upper levels of the pyramid require a bit more finesse to get beyond. That is where the book "Switch" has given me some insights into creating an easy way to help flip the "Switch." It was interesting that they used a new framework or phrasing for describing the two independent systems in the brain. 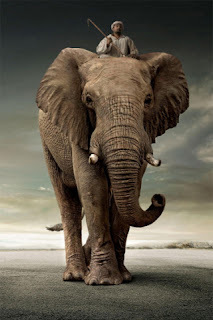 The emotional system was named the Elephant and the rational side was named the Rider. These two can work together to help steer our decisions and actions in life. However, they can often be in conflict and battle for control. While the Rider (our rational side) holds the reins, it is much less powerful than the emotional Elephant. You should also keep in mind that the Rider uses self-control to maintain control of the Elephant. But, self-control is an exhaustible resource. It is very draining to try to control the emotional side of ourselves. So what are some methods for approaching change keeping in mind the rational thinking of the Rider and the emotion driven resistance of the Elephant. Find the "Bright Spots." - Find the successful teams, schools, teachers, and copy their success. This seems obvious, but is often over looked, or people will give you the, "yeah it works there or for them, but...." Instead, make it easy for the Rider to say, this has worked before and appears rational. Script the Critical Moves - research has shown that when given options (the more the worse) people will tend to choose the most familiar or the easiest to perform. Sometimes, when an action is known to work, but people fear the change, you must create a script for the action, so that people can avoid confronting the choices. This leaves the Rider feeling in control. Point to the Destination - This one also appears amazingly simple, but can be very effective at directing the Rider. Create your BHAG (Big Hairy Audacious Goal) and state it in a way that is understandable and appealing to your team. The Heath brothers prefer to call it a Destination Postcard. A vivid picture of the near term future of what could be possible. Is your vision clear enough that it is visible to all? Does it spell it out clearly where you are taking your school? Make sure your goals are also Black & White goals, so there is no confusion. Find the Feeling - When historical data doesn't help make a case for change, then this step can help stir the Elephant. When you don't have the authority or the resources to make a needed change, appeal to the emotions of your team and watch the momentum swing. If they can find the feeling, the sense of urgency to change, then it may happen quicker than you thought. Shrink the Change - sometimes the change is perceived as a mountain to climb. When stepping back and seeing the whole process, it can look like that, but if we were to shrink the change to small manageable pieces and frame it that way, it looks like a task we can tackle. Running a mile doesn't seem so bad, when you let them start from the 1/2 mile point. Adjust the frame, and make your targets smaller and your team feel up to the task. Starting the task is the hard part, so appeal to the emotions to get things started. Once there is momentum, it is easier to keep going. Grow Your People - This is the opposite approach to Shrink he Change. Here, you build your people up so that the task seems small no matter how large. The Team is so GREAT and proud, that the challenge would not matter as this team could take on anything. Get your team to rally around three internal questions. 1. Who am I? 2. What kind of situation is this? 3. What would someone like me do in this situation? Create an identity that your team will aspire to, then keep that in front of them. Tweak the Environment - what often looks like a person problem, can actually be a situation problem. Leaders often believe resistance to change is a behavior problem when it is actually due to the situation they find themselves in. This seems easier to accept when it is more than 2 or 3 people on your team. Quite often team members are not willing to make the change due to an environmental problem that could easily be changed. Is there a way you can tweak the environment to allow the changes you want to easier for staff to accept. Think schedule, procedures, paperwork, etc. Are any of these things adding to resistance, or could some of those things make it easier? Rally the Herd - This may have been one of the most interesting chapters in the book, and possibly the most common battle we face in schools when approaching a change process. When an individual finds their self in an unfamiliar situation, they tend to look around and follow the crowd. The problem with organizational change is, if no one is stepping out to lead the way, who becomes the point person to lead the new behavior. This behavior is more common than we think. We have all heard stories of someone being mugged or raped in plain sight of a crowd, but because no one reacts, the abuse continues. Yet, if a single person walking through a park were to witness this act they are much more likely to action to stop it. In a crowd we tend to follow the action of the crowd, we are all looking for the one person to lead, and since we all look, no one leads. We stop and analyze the crowd, how are they reacting? We follow their lead. It's not really peer pressure so much as peer perception. Behavior is contagious. This is why I need to hang out with @stumpteacher @benjamingilpin and @posickj much more often. They are runners. I am not. But if I want to be a runner and more healthy (and I really do) I'd be wise to surround myself with people that do. So how do we do that in our schools. Well, you can focus on the bright spots, but that really only works when the majority of the herd is part of that Bright Spot action. If the majority of the herd is following negative behaviors, then you will want to use a different tactic. While I know some people will bristle at the idea of being manipulated, as some may feel the book attempts to teach, it really just explains about human behavior and how to create a framework that eases that path for everyone. We all get comfortable in our ruts, and change doesn't always seem to be necessary. But if we are striving for growth, change is inevitable and will need to take place. The good news is, there is sound advice that can help that happen. I hope these tidbits can help you encourage growth and change in your school. My advice though, is to get the book, "Switch," by Chip and Dan Heath, read it thoroughly and make notes throughout. There is some incredible insight into people's habits, behaviors and the change process, that can definitely help you steer the Elephant and Rider to success. Great insight Tom, enjoyed this reflection on your year and PLC initiative. After have gone through 6 administration changes in my 12 years teaching, I feel, this post would help any administrator. This is a great post about change and the different ways that educators, and not just principals, can assist with change. I'm going to need to read Switch for the new perspective. Both Lencioni books (5 dysfunctions and silos) that I have read are awesome and provide a great format for discussing change with leadership groups. Keep up the great work, Tom, and I'll look for you running down the road one day soon. Great insight! Really enjoyed reading this post and will be taking a look at some of the resources/books referenced in this post.